The line between truth and propaganda is often blurred. Distinguishing publicly between the two in an election year, in the middle of a media battle rarely if ever seen in this politically polarised country, needs a cool head and a thick skin. 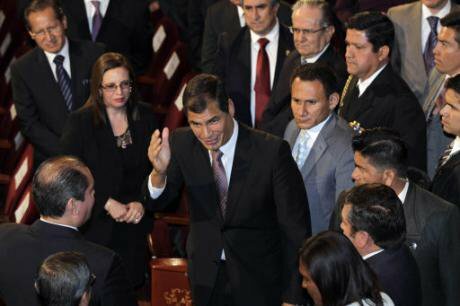 The adversaries, the government of Rafael Correa and a center to right wing opposition supported by some leftists and people whose motivation is more personal, are giving no quarter. The left, with few resources, has been confined to the margins. The majority of the tendency, with notable exceptions, feels compelled to choose between two unpleasant options: turning a blind eye to the tactics of right and its 'allies', or remaining silent, thus implicitly supporting the government. The major salvo of the battle has been the so-called documentary ‘The CIA in Ecuador’ presented a few weeks ago on Telesur, a channel that basically toes the government line (hardly surprising given that it is a joint project between Venezuela, Ecuador and Brazil, after having lost Argentina following the Macri government withdrawal of support, shortly after being elected). In its spycatcher style, the film explores the activities of various US agencies in the country and their contacts with a number of members of the opposition. Documentary it is not, but while lies, half-truths and insinuations there are aplenty, in the mire of disingenuousness truth is also to be found. To be more specific, the film branded several opponents of the Correa government as collaborators of US intelligence agencies (the CIA): Fernando Villavicencio, Martha Roldós, Andrés Paez, the Four Pelagatos (a right-wing anti-correa magazine), amongst others. As evidence we were presented with photos of meetings with embassy officials and even a copy of a payroll of the National Endowment for Democracy (NED) on which appeared the name of Juan Carlos Calderón, editor of the online Centre Right magazine, Plan V.
As might have been expected, the reaction was fast and furious: sheer fancy; this is not journalism (evidently); the Correístas are trying to blame the CIA for their own failings; they refuse to take responsibility for anything; they don’t realise that the Berlin Wall fell decades ago. In short, the film is pure conjecture and denying everything (“We are all CIA agents now”) is the line to take. The reality is somewhat more complex. It is true that all the evidence could be part of a fabrication designed to discredit the opposition. But with a little equanimity, which in this country’s polarised political climate is in short supply, the thesis is difficult to accept. Most of it? Perhaps. All of it? No. The government spin doctors are not fools (generally); they are quite aware that propaganda works best when it is a mixture of fact, half-truths, and lies that the public is primed to believe. The facts include the trips made by Juan Carlos Calderón and Martha Roldós (daughter of ex-president Jaime Roldós) to Washington (the caricaturist Bonil also met there with the NED); that they also requested funds from that institution has to my knowledge never been denied. These are not secrets nor, incidentally, illegal. Nor does receiving funds from the NED imply being an 'agent' of the CIA. Thinking of 'agents' could even be classified as a misconception, a hangover from the time of the Cold War. The CIA continues to recruit moles or agents, indeed, but the tactics change when the purpose is not to steal military or state secrets or defeat the ‘enemy’ but to influence public opinion and intervene furtively in the electoral process of another country. As the ex-Foreign Minister Francisco Carrión noted in a video released by the national daily El Comercio, it is absurd to classify people like Roldós (whose father was probably killed with the help of US agencies) or Gustavo Larrea (an ex ally and minister in Correa’s first cabinet) as agents of the CIA. One might even be tempted sympathise with them because, as with others mentioned in the video such as Calderón, they have suffered at the hands of Rafael Correa and a government whose general policy is to cow its opponents-enemies, in particular those engaged in exposing cases of corruption. More difficult to accept is Carrión’s thesis that the 'documentary' is an attempt to divert attention from what is happening in Venezuela, and that as Ecuador is not in a situation of confrontation with the United States, the country is therefore free from political interference. It is curious that a person of his experience should make such claims. Carrión is not naïve and his statements therefore can only be interpreted as politically motivated. He is no fan of Rafael Correa. However, despite not being 'agents', what Roldós and Calderón, Villavicencio and others are doing when they decided to receive funds from bodies such as the NED, cannot be classified in any way as progressive. Working with an agency as disreputable as the NED, whose prime objective is to interfere in the internal politics of countries on the US’ disagreeable list is, shall we say, a dubious tactic. For people who profess progressive views, it goes beyond distasteful, and can hardly be expected to lead to that other world we are constantly assured is possible. And the justifications simply don’t wash. As the ex-parliamentarian and political analyst Diego Delgado once said when analyzing the first six months of supposedly progressive government of Lucio Gutiérrez: "If you live in Quito, you're not going to go Cuenca by way of Ibarra" (To put it in a European context: If you live in Helsinki, you don’t go to London via Rome). For some, of course, that matters little. Political propaganda it may be, but the film goes beyond complaints against people receiving funds or talking to 'spy masters' or even with officials from the US embassy, which in the latter case, it bears repeating, hardly represents proof of a lack of loyalty to the country. The truly reprehensible aspect is that the authors attempt to discredit others, whose offense is nothing more than to be considered problematic by the Correa government. Several people are implied to be collaborators simply for posting information that inconveniences the government, and against whom no evidence of complicity or even contact with US agencies exists. Nothing more than an attempt to demonise for political purposes. Such is the case of Jorge Rodriguez of the Anti-Corruption Commission (as if he was the only member) whose name appears in the network of supposed conspirators for having delivered the results of the investigations of the Commission (which according the video operates "outside the law") to Juan Carlos Calderon of Plan V, who then, says the narrator of 'documentary', passed the information to Monica Almeida of the daily El Universo, a right wing newspaper high on Correa’s black list. But no accusations were made against Almeida (a member of the Panama Papers team) that goes beyond receiving the information from the Commission. There is more. Without mentioning names, the 'documentary' speaks in general terms about members of unions and the indigenous movement, while at moments the camera fixes on the figure of Nina Pacari, a well respected indigenous leader and a former member of the Constitutional Court, with the clear intention of insinuating that she is also a CIA collaborator. Pacari, Rodriguez and Almeida have their reasons for opposing the Correa Government, but this in no way makes them ‘agents’ of a foreign power or enemies of the state. Despite what Francisco Carrion says, that US agencies are active in the country should surprise no-one. Their objectives are US objectives, and their mission is to order the world according to the interests of their country, either by legal or illegal methods. Ethics are of little importance. That being so, and being widely recognised to be so, the fundamental question is why Alianza País’ political opposition have been so willing to resort to representatives of a country that for the majority of Ecuadorians does not coincide with theirs interests the majority of the time. Few believe that what is good for the US is good for Ecuador. And if it is true that US agencies have managed to subvert social organizations and virtual publications in the country to such a large degree, what responsibility must this same government bear for opening the door for them? It is that all opponents are crazy or destabilizers? The argument lacks even the most basic logic. Except for the personal grudges that some harbour, many of those well-founded, the obvious answer is the lack of transparency and the excessive control that has prevailed in the country for a decade [i] The control of information – in particular that related to corruption – and the projection of an image of pulchritude while at the same time hounding those who dare to speak by means of a submissive judicial system only creates the impression that there is much to hide. Controversial cases such as the (still) Attorney General and his home in Florida only serve to confirm the suspicion. Such a visionless policy only creates the fertile ground in which shadowy agencies like the NED can operate. It is true that people Fernando Villavicencio are 'questionable' (his style as well as his political incoherence), but that does not mean that his exposés are always false, always the inventions of a feverish mind. They are not: he has his sources, in particular related to the oil industry. Those who enjoy greater personal prestige, such as the members of the Anti-Corruption Commission, are also threatened when they present their research. Why? The argument by many of the ruling party is that the group is illegal, that responsibility is that of the state. It is an explanation that simply does not convince. The government should look in the mirror. One wonders why there should be a widespread feeling that the Commission is necessary and that threats against its members and efforts to undermine its legitimacy are little more than an attempt to keep the lid on a cesspool? Why is there a widespread feeling that the workings of the state corruption control authorities (legal but illegitimate) amount to little more than a game of smoke and mirrors? Why is there is a widespread feeling that people like Calderon and Almeida are being persecuted solely for helping to expose cases of corruption? Agreeing with the political s views of the people mentioned above is not part of this particular equation. What they do is not illegal, even if accepting money from the NED is ethically questionable and will certainly not help to create the egalitarian society many of us work for. One can agree or disagree with their worldview – I must emphasize that I do not, and would not accept funds from a US intelligence agency – but the point is not that, rather how the lack of transparency, the lack of corruption control, and the lack of accountability of the judicial system, create the conditions in which US agencies can operate more freely.